American songwriter Irving Berlin captured these feelings in his song, "White Christmas." It is one of the most popular Christmas songs of all time. Over the years, hundreds of singers and musicians have recorded "White Christmas." 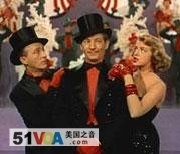 But the version most people still know best was sung by Bing Crosby. Songwriter Irving Berlin was born in Russia in eighteen eighty-eight. He did not celebrate Christmas as a religious holiday. He was Jewish. To all of you, best wishes this holiday season from all of us in VOA Special English. This is Steve Ember. The previous year Adolphson had starred in a play in which Ingrid had been an extra. Branches sway gently in the wind. Dornberg slapped the table with the palm of his hand. 1.And I’m longing to be up north. I long to travel to far places. I do want and long to discreet in this.